Description: Sitting in the old PPG yard. Description: Northbound at north end of the Lawrie siding North of Guthrie is this manifest train. Description: BNSF local sit in the yard. ~ BNSF Beardstown Sub. Description: Drayton Local south late in the day with nice power! Description: Nice power on today's Drayton Local! You can clearly see where they patched 'BURLINGTON NORTHERN' on the lead unit. Description: BN on the nose, BN on the longhood...BNSF 3149 shows off it's heritage! Description: A BNSF Stacy Yard Job transfers cars from the BNSF Stacy Yard to the UPRR Argo Yard in Seattle - BNSF SW1500 3436 and BNSF GP38-2 2344. 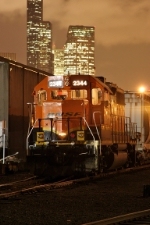 Description: A BNSF yard job switches the south end of Stacy/Seattle Intermodal Gateway. Description: BNSF yard jobs switch the south end of Stacy/Seattle Intermodal Gateway. Description: The JY local holding @ 27th st for a few minutes before heading to Dilworth Yard.